We’ve written a lot of articles about clean alternative living here at Van Clan; the Leaf Tiny Eco House, the Dalbury Electric Campervan, the Electric Trailer camper, and a whole host ofhttp://www.apple.com off grid tiny homes that help to reduce your carbon footprint. The thing is, most of these scenarios involve warm countries, companies that are there to help you whenever you call, and generally little effort on your part. Wouldn’t it be amazing if somebody went on an incredible off grid adventure to help spread the word about zero waste living? Maybe to…oh, I don’t know…Antarctica or something. Now that would be cool, wouldn’t it? YES! It’s like every top gear challenge rolled into one, but this time Jeremy Clarkson isn’t trying to destroy the planet at the same time. This could be one of the most exciting travel stories that we’ve ever covered here at Van Clan, and one of the coldest too! Edwin & Liesbeth ter Velde are a normal Dutch couple who decided that the amount of single-use plastic items that they were throwing away was getting completely out of hand. I’ve felt this too and have tried my best to recycle and take my own packets and containers wherever I can, but Edwin and Lisbeth have taken it one step further. 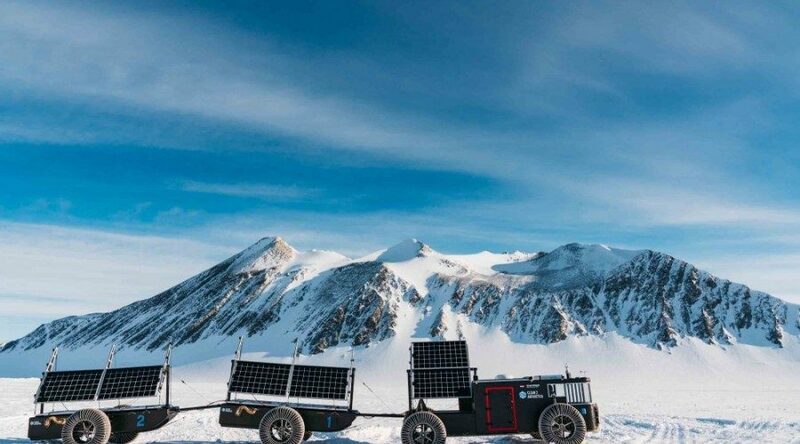 Instead of piling their plastic up to take to the local recycling plant, they built a solar-powered car out of it and decided to drive it to Antarctica…as you do. It’s called the Solar Voyager, and it’s completely eco-friendly. Wait…What! This Off Grid Adventure Car Is Made From Recycled Plastic?! That’s right, the entire vehicle is made from recycled goods, though you wouldn’t be able to tell from looking at it! These brainy eco-warriors came up the idea of collecting taking their plastic waste, sorting through it and then melting it into wire which they took to a 3D printer. 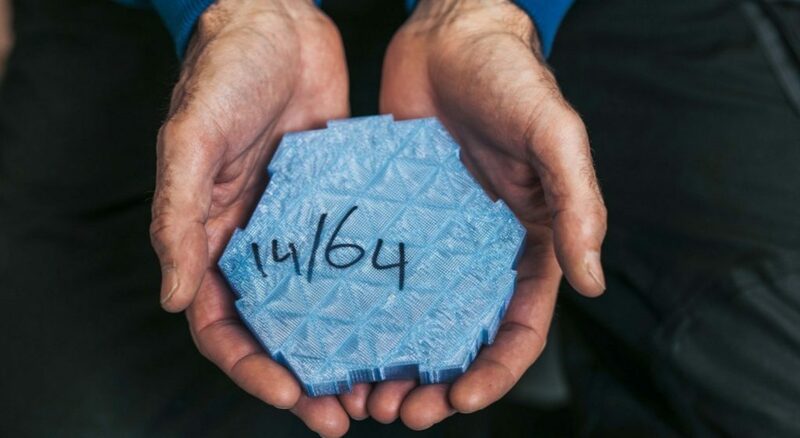 The car itself is made up of hexagonal jigsaw style pieces that are made from this 3D printed wire – no aluminium, no steel, just recycled plastic. This is a major breakthrough for green living enthusiasts all over the world; using waste plastic to make cars sounds like something that you’d see on a Netflix Sci-Fi series, but if these two seemingly ordinary individuals can make a change like this then companies like VW and Mercedes should perhaps sit up and take notice too. 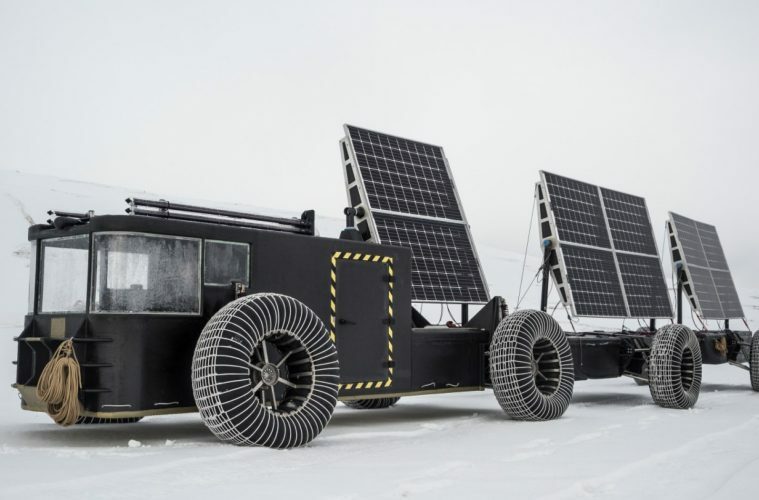 The off grid adventure revolves around taking a solar-powered car to the South Pole, and the thought that’s gone into making this dream happen is unfathomable to a lowly pizza-loving writer like me. Ten large solar panels provide all of the power for the Solar Voyager’s engine, so there’s no nasty exhausts or desperate searches for a petrol station down Penguin Boulevard. A series of vacuum pipes melt the ice underneath this off grid camper, and Edwin and Lisbeth have used unique weight-bearing wheels to distribute the weight of the car to make driving over ice more efficient. This off grid adventure car is 16m long, so it’s not easy as navigating a country lane with a compact camper. Can you imagine driving something like the Ford Earthroamer over ice? Luckily it’s something that you’ll never have to think about because Antarctica has a zero waste law and is very strict with fossil fuel rules. It contains 90% of the world’s ice and is not owned by any single person or government. It was the perfect final destination for this off grid adventure. A team of people helped to test drive the Solar Voyager in Iceland in 2018, and in December of the same year, Edwin and Liesbeth started their journey. Tell Us More About The Off Grid Adventure! 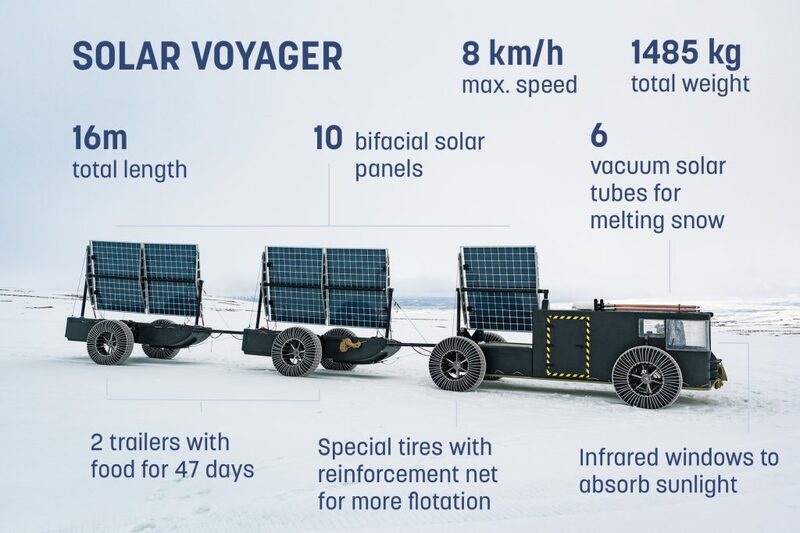 The Solar Voyager will begin its off grid adventure at Antarctica’s base camp and will go on a journey to the South Pole and back using nothing but the Sun’s rays for energy. If you’ve ever read our UK Vanlife Hardest Bits article, then you’ll know that finding sun to charge up our batteries was always one of the toughest parts of living the van life. Edwin and Liesbeth won’t have to worry about this problem on their staggering 2400km journey, as the Antarctic is an icy plain where the sun never sets. Think of it as a desert, but one that’s just insanely cold all the time. 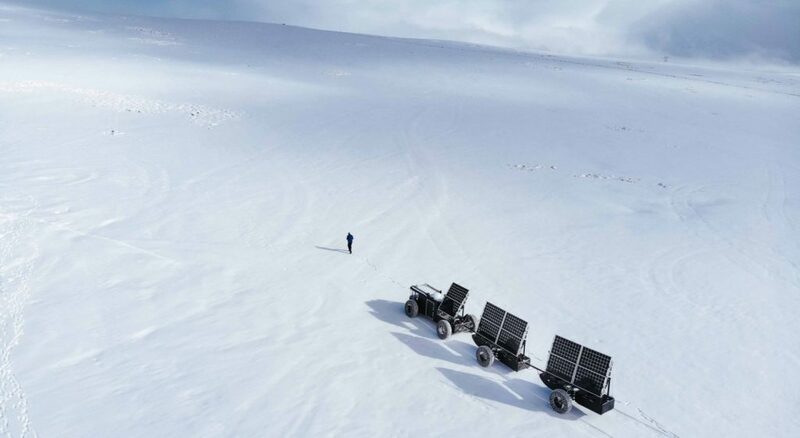 The Solar Voyager will be taking on this off grid adventure in temperatures of -30°C on one of the most perilous and bleak terrains on the planet. 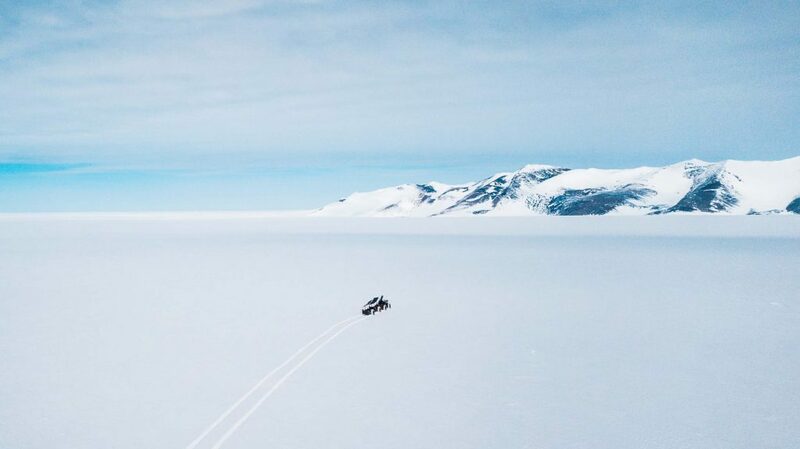 Antarctica is an unforgiving continent, so this isn’t going to make it onto our top road trips list for 2019, and Edwin and Liesbeth will have to live and work in these freezing temperatures throughout their journey. The driver’s cab isn’t heated, so it looks like they’ll be wrapping up warm and drinking plenty of tea to keep them from turning into solar-powered snowmen. This has to be the most insane journey that I’ve ever read about, and it’s one that two people are doing willingly too don’t forget. But, it takes brave people doing insane things to make the world stand up and listen, and I doubt that this is a story that you’ll ever forget. This off grid adventure is about more than two big kids ticking off a dream; it’s about proving that you can create sustainable vehicles from nothing and that zero waste living is the key to making a society where we stop taking from the world and giving nothing back. This off grid adventure is also raising awareness about the Antarctic treaty and the fact that it’s up for renewal in 2048. This might not seem that important to you now, but if it isn’t extended then, commercial companies can start exploiting this untouched continent for their own personal gain. You were pulled in by the fantastic picture and title, and now we hope that Edwin and Lisbeth’s journey might make you think a little harder the next time you lob a plastic straw in the trash. You can follow this amazing adventure by visiting the Clean2Antarctica website! Like the sound of eco camping? This bicycle camper might be just what you’ve been looking for! Harness the sun for your own gadgets with this portable solar charger. Planning your own off grid adventure? These vanlife tips might help you to plan your trip!